Comparing history with Hollywood. Despite this semi-official tagline for the Based on a True Story podcast, from time to time I like to do something different. That’s why I’ll periodically take a look at the history behind a movie before that movie is released. If the concept behind the Based on a True Story podcast is to learn the true story behind your favorite films, the concept behind releasing an episode about an as-yet-to-be-released film is to give you the true story before you go see it. That way you won’t have any spoilers to the movie when you see it for the first time and you’ll also be able to do your own comparison of how accurate the film was to history. On February 20th, 2017, episode 40 of the Based on a True Story podcast was released as one of those future-looking episodes. The movie we were focusing on was Bitter Harvest, which released in the United States four days later, on February 24th. In that episode, we learned more about the historical story that surrounding a little-known event in history was released in the United States. Bitter Harvest tells a story during Holodomor, a man-made famine in Ukraine during the 20th century. If you haven’t heard that episode, I’d suggest giving that a listen over here. Soon after the above episode was released, I had the honor of chatting with Richard Bachynsky-Hoover, the writer and producer for the film. With the movie being released on DVD and digitally tomorrow, June 13th, 2017, I thought it’d be a great time to get more details behind the true story of Bitter Harvest. Richard agreed to share some details behind the film’s history and creation. Now, in a Based on a True Story first, let’s take a few moments now to get an exclusive peek at what it’s like to create a movie that’s based on a true story as well as getting a much deeper understanding of the story behind Bitter Harvest. Richard was born in Canada as one of ten children born to Ukrainian Yaroslav Bachynsky and Canadian Ada Hoover. That’s nine boys and one girl. As a child, Richard was always great at telling stories, but he didn’t grow up wanting to be a writer. As is the case for many of us, life happened and ultimately he was never able to see the dream of attending art school to fruition. Instead, he had to find jobs to pay the bills. Then, at the age of 30, he did something he probably never could’ve imagined doing when he was a child—Richard became an actor. This required him to read countless scripts and spend long hours studying, not art, but acting workshops. The official trailer for Bitter Harvest. Learn more on the film’s website. As he was studying, he started to see a trend of other Ukrainians throughout history who had themselves risen from the peasant class to become well-educated in the arts and poetry or science and the Church. As is perfectly normal for anyone, Richard started to see some similarities between these Ukrainians and himself, a half-Ukrainian half-Canadian whose dream of attending art school was never realized because of the need to put food on the table. In particular, one piece of Ukrainian history really stuck with Richard. That was, of course, what we now know as Holodomor. We cover Holodomor in more detail in the podcast episode that’s embedded above, but essentially the term Holodomor means “murder by hunger” and is a dark spot on world history. Much like the Holocaust that killed millions of Jews at the hands of Nazi Germany, Holodomor saw millions of Ukrainians die from either execution or starvation. Most historians consider Holodomor to have taken place between the years of 1932 and 1933, but mostly because that’s when the height of the murders took place during Stalin’s Soviet Russia’s rise to industrialism. With Ukrainian blood on his father’s side, Richard knew about Holodomor but as an artist there was more than that. This horrible blemish on the face of history was something that struck a note as he continually uncovered countless stories of other Ukrainian artists, scientists or highly educated people who were systematically murdered. In particular, one of Richard’s ancestors, Yulian Bachynsky, worked hard to see an independent Ukraine. He was the ambassador from Ukraine to the United States from 1919 to 1921. As a little side note, Yulian was also a writer. One of Yulian’s books called Ukraine Irredenta was all about an independent Ukraine. So there might not be official documentation from the Soviet government mentioning that book as the cause for Stalin’s wanting him silenced, but that doesn’t mean it didn’t exist. Unfortunately, because Stalin’s regime hid everything from the world so well, there’s a lot of documentation we just don’t have. Remember that there weren’t official documents for the entire existence of Holodomor wasn’t known until the fall of the Soviet Union many decades later. What we do know is that Yulian’s book infuriated Stalin. Yulian would end up being sent to a Gulag, or prison-camp, in a region that’s now divided between eastern Finland and western Russia called Karelia. He never returned. Despite being born in Canada, Richard spent many years of his adult life traveling across Ukraine. Both Ukrainian, on his father’s side, and a talented artist, Richard sympathized with the stories of creatives being targeted by Stalin during Holodomor. The more he heard the stories of what it was like during Holodomor, the more he knew it was a story that needed to be told. Not just a story of what happened, but a story what it was like for the people who had to live through it. “I traveled all over Ukraine for many years,” Richard recalled. “I became so compassionate to tell the Holodomor story that’s locked up in many faces—the silent pain in the gazing looks—many I sense have been haunted by those stories. As Richard traveled across Ukraine, he’d often find himself sketching life around him whether it was on a train, on a bus, plane or in a café. With a target painted on the back of artists and other creatives by Stalin during Holodomor, Richard’s own artistic passion was something he wanted to write into the film. That’s why, in the movie, Yuri is artistically talented. For example, there’s a scene where the main character, Max Irons’ portrayal of Yuri, is traveling to Kiev and passes the time on the train by sketching. That’s similar to Richard’s own life. Getting a film written, though, is easier said than done. As he traveled, Richard continued reading Ukrainian history, attending functions and, of course, face-to-face conversations with many people who were old enough and fortunate enough to have survived Holodomor themselves or had ancestors who had. All the while, he was amassing sketches and notes from the stories he collected. Of course, coming up with the story is only one part of getting a movie made. This is especially true for a film like Bitter Harvest, the very first feature film in English on the subject of Holodomor. When you’re the first of anything, it’s not easy. After all, in an age when nearly every other movie hitting theaters seems to belong to a franchise of films, it’s not easy to convince someone to fund something that, quite frankly, isn’t almost guaranteed to make their money back thanks to an already-established franchise. It was a mountain to overcome, and one that Richard knew would first require funding. After knocking on many doors, finally, he found the right door. With funding secured, the story Richard had already started had a promising future. He continued refining the story while Ian kept an eye on what was being written, allowing the story to progress naturally. Richard, who had been taking notes in pen, pencil and a ton of sketches, taught himself how to type so he could write the story. It was a slow, thought-out process of taking all of his various notes and sketches laying out plot lines, scenes and the history he’d read about and learned from people across Ukraine and translate that into a story. During the process, he sent the story, which was still a work in progress at this point, to the very experienced and extremely talented director, George Mendeluk. Left to Right: Camilla Storey, Ian Ihnatowycz, Max Irons, Samantha Barks, Tamer Hassan and George Mendeluk attend the New York Premiere of ‘Bitter Harvest’ at AMC Loews Lincoln Square on February 16, 2017 in New York City. Richard and George had worked together about 15 years prior on a low budget Canadian film called Men of Means that was released in 1998. While working on that film, Richard was still paying the bills by acting, but the two struck up a friendship because of their shared Ukrainian heritage. So when it came to get a talented Ukrainian storyteller’s perspective on his new film, there was perhaps no one better for Richard to reach out to than George Mendeluk. In all, after the original story was written, Richard wrote nine drafts of the screenplay. Then, on the final script, Richard and George teamed up to get it to a point to where it was ready for shooting. During all of this time, Richard was not only working on the story, but working hard to find teams, crews, Ukrainian actors and locations for the film. The story told in Bitter Harvest follows two lovers, Yuri and Natalka. While Yuri and Natalka’s story wasn’t a true story we can prove with documentation, it’s one that certainly could’ve happened. Similar to Richard’s ancestor, Yulian Bachynsky’s fate, there were countless scores of Ukrainians who were deemed “enemy of the people.” These people were sent to horrible places like the Solovets Island in the White Sea, Kolmya or Solovetsky Monastery, which was built in the 15th century but was converted to a prison in northern Russia. Like the Holocaust, the loss of life was so massive that we simply don’t know exactly how many people were killed in such ways. We know of some famous people of the time who were sent to their death by way of prison camps. Many of these were creative people like Les Kurbas, a writer and theater director. Stalin targeted creatives in particular because their works were essentially uncovering many of the horrible things the Soviets were doing. In his eyes, any and all anti-Soviet propaganda must be stopped. So the way he did this was to murder the people creating it. Richard wanted to pay tribute to artists like Les, and did so with the character of Mykola, who’s played by Aneurin Barnard in the film. Himself an artist, the stories of the artists, musicians and priests stood out to Richard—stories that most of the world has simply forgotten. These are the sort of stories that Richard read about and heard about during his travels. Was it murder by hunger like the name Holodomor would suggest? Or was it more than that? There seemed to have been a target in particular on those who were at the forefront of Ukrainian culture. Even the use and study of the Ukrainian language was banned. Yuri is played by Max Irons while Natalka is portrayed by Samantha Barks. These rebellions, or really anything the Soviets saw as disobedience, were met with brutal and horrific repercussions. While plenty of executions were done by gunshots, Stalin’s preferred method of murder was starvation and torture. This not only helped impose a menacing fear into the Ukrainian people while saving the Soviet Army the munitions costs it’d take to murder countless people. Crops and food were confiscated and used to feed the Soviet soldiers, Moscow and others who were deemed “good” citizens of the state, leaving Ukrainians to starve—often times in the fields that they were working. Meanwhile, outside of the Soviet Union, everything seemed to be alright. “The Communist Kremlin Central Committee was getting ‘Dizzy with Success’, Stalin quoted, and Walter Duranty earned a Pulitzer Prize for his reporting in The New York Times or Chicago Tribune,” Richard said. The article Richard mentioned was an article published on March 2nd, 1930 by Stalin. You can read it here. Walter Duranty, was an English-born but American reporter for The New York Times who worked as the Moscow Bureau Chief for the paper for 14 years. Despite winning awards for his reporting at the time, it wasn’t until the turn of the century that the horrific events in Ukraine started to come into the public’s eye and Walter Duranty’s Pulitzer Prize was questioned by many. In 2003, the Pulitzer Prize Board issued this statement on the subject. The decision to let Walter keep his prize for journalism is something that not everyone has agreed with. One particular battle of journalism Walter picked was with a British reporter named Gareth Jones. Gareth had witnessed the famine in Ukraine and reported what was really happening; something Walter’s reports specifically denied. Even this bit of detail was something Richard offered a nod to in the film. “I paid tribute to Gareth Jones in the movie as an ambiguous journalist on the train that Yuri meets after sketching him,” Richard said. When it comes to historical accuracy, no one expects a feature film to be entirely true to history. After all, that’s the entire premise of the Based on a True Story podcast. This is perhaps never more true with a story like Holodomor. Much of what really happened has simply disappeared with the witnesses who lost their lives or blatantly covered up by the Soviet Union. There are some scenes in the film that were tributes to Richard’s personal life. For example, there’s an orphan, Lubko, who’s played by Jack Hollington, that Yuri happens upon in a forest. Richard’s own father was orphaned at only eight years old and wandered around Manitoba, Canada for years as he was in and out of farms and homes for homeless kids. Another great tribute to family in the film was during one of the opening scenes. In the opening minutes, there’s a shot of a beautiful sunflower that then pans up to reveal a field full of sunflowers in a village called Smila. Then we see a little boy playing walking through the field swinging a wooden sword. The next scene is that same little boy swimming in a nearby river, and before long we find out the little boy is the main character, Yuri, as a child. Max Irons, who plays an older Yuri, has voiceover explain how things were before he knew that dragons were real. That little boy is a tribute to Richard’s son, Yevhen, who did many of those things younger Yuri did. Yevhen, like Yuri, was born in Smila, Ukraine and spent countless hours as a child swinging his wooden sword at the tall sunflowers pretending they were evil, red dragons. If he wasn’t slaying dragons in the field, Yevhen loved going swimming in the river—again, like the little Yuri we saw in the film. While Yevhen’s enemies may have been pretend dragons, with all of the history Richard had uncovered, he knew those dragons were real. Only, they came in the form of humans—Lenin, Stalin and the Bolshevik Red Army. Even though these aren’t based on details that happened during Holodomor, they’re important to know because they show that every scene has meaning. It may not be meaning understood outside those who remember the horrific events that took place in the 1930s, but it’s little details like this that help add to the authenticity of the film. While there’s no documentation that could ever prove this, surely Yevhen wasn’t the only little boy growing up in Ukrainian fields fighting evil in the form of Red dragons. The same fields where blood was shed only decades before. In my conversations with Richard, it quickly became clear that family is very important to him. 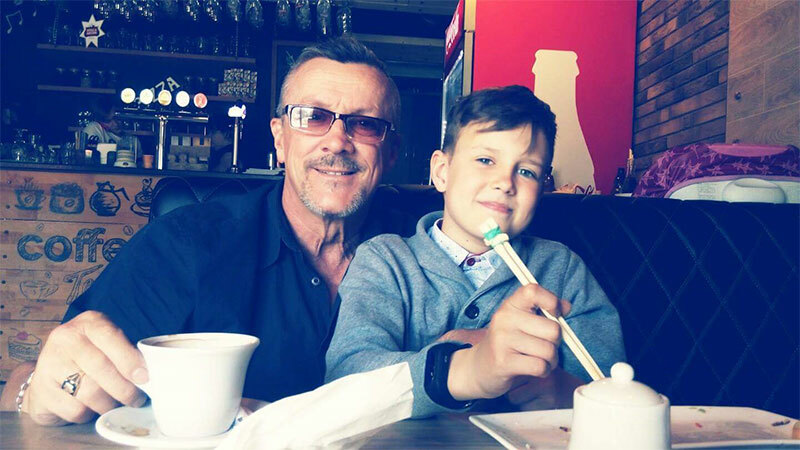 Here he is pictured with his son, Yevhen, and the inspiration for the opening scene of Bitter Harvest. Some movies are more historically accurate than others, of course, but ultimately anyone going to see a feature film is wanting to be entertained by the story. While no one minds some learning, generally speaking historical accuracy and education is largely left for documentaries. With this in mind, I couldn’t resist the opportunity to ask Richard what it’s like balancing historical accuracy in a film as a writer. On one hand you have the stories you know need to be told—the true history. On the other hand you have an hour and a half or so of entertainment the audience expects you to offer them. Like any film, there were some scenes that didn’t make it into the final edit of the movie. Ultimately, according to Richard, it was something he tried to balance the story and history and the narrative to be even-tempo and work together. Beyond the story, as part of the deal to get the film made, Richard demanded that he was not only the writer but also a producer. This allowed him to be the one to make the decision to shoot the film solely in Ukraine. As a result, Bitter Harvest not only helps this part of Ukrainian history that’s been largely forgotten by most of the world to the forefront, but it also helps many of today’s Ukrainian creatives shine in the international spotlight. The Holodomor story is one of great loss; it’s the story of how the Ukrainian people overcame the horrible tragedies that happened. Sadly, tragic stories are something that many in Ukraine know even today—Richard included. “I wrote this film and faced a lot writing it,” Richard said. “Thinking of death and dreaming it for years. It was in the Maidan revolution, seeing first-hand men being shot, carrying them and assisting in the struggle all winter as the film was shot. These life-threatening challenges of making a movie during the 2014 Ukrainian revolution were just the tip of the iceberg. Ten years prior, in 2004, Richard’s mother passed away from brain cancer. Then in 2012, his father, Yaroslav was gone. If the name Yaroslav rings a bell, it’s because Richard named a character in Bitter Harvest as a tribute to his father. That character was played by Barry Pepper in the film. As if that weren’t enough tragedy for one family, four of Richard’s brothers have passed. The first at age 35 in 1990, then another at only 45 just a year later. Another aged 58 in 2008 and yet another at only 63 in 2015. And there were more, Richard explained to me. Some cousins he was close with whose deaths were also way too young. All of this tragedy in a single family. Unfortunately, it’s not something unique to Richard’s family. Richard (left) alongside two actors he helped cast, Alexander Pecheritsiva and his now-wife Anastasia. They met on set and were later married. This photo is from the Kiev Premiere of Bitter Harvest where the Ukrainian President’s wife, Maryna Poroshenko, thanked the filmmakers for being the first to tell the story of Holodomor in an English feature film. Although some movie critics gave Bitter Harvest less than stellar reviews on its release, not everyone was so critical. Richard and the other filmmakers received a letter of respect from the Australian ex-Prime Minister Tony Abbott and both the President of Ukraine, Petro Poroshenko, and his wife, Maryna. Both the President and his wife attended a party in Kiev for the movie and thanked all of the filmmakers. But film critics or even politicians weren’t the reviews that truly mattered. At a private screening with his family and friends in his hometown, there were six empty seats besides Richard. Sadly, it was a bittersweet moment. As Richard explained to me, about 85% of the Ukrainian audiences loved the film as it brought tears at every screening. Himself attending some of the screenings, Richard and many of the other filmmakers involved were able to get face-to-face thank you and congratulations for the movie. “The audiences emotions told us everything,” Richard said. 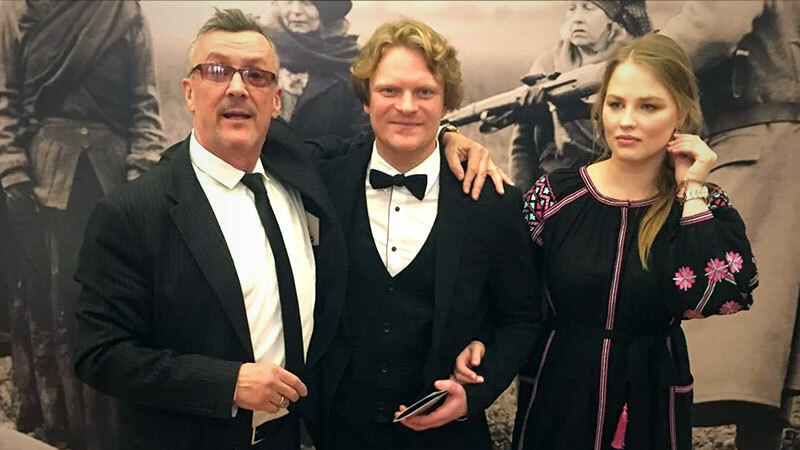 “It hit home to them deeply, opening old wounds to be cleansed again and to be rewarded in a film with dignity, and respecting that we cared about making a film about each of them and their ancestors—and for the living proud Ukrainians in the audience. “Pity my dad or mom never witnessed the smile on my face when I had the film greenlit,” Richard continued, “but heaven has its own silver screen and God writes, too. And He makes movies up there, I’m sure. With six seats reserved to show our film to the lost victims of Ukraine and elsewhere, I’m sure they all saw the film, too. That makes my day here on earth and for the survivors, today, who suffered and their families who are haunted by the stories as I was.